Marketing Strategist takes charge of a variety of job tasks, including designing digital-marketing campaigns, marketing research and developing a cohesive profitable marketing strategy for the company. The job responsibilities that are commonly listed in the Marketing Strategist Resume are setting marketing goals, designing and implementing marketing strategies, analyzing sales and marketing metrics, generating innovative ideas for promoting new products, addressing advertising needs, forecasting market trends, researching marketplaces for new opportunities, ensuring brand consistency, liaising with internal teams and establishing robust long-term web presence of the marketing products. 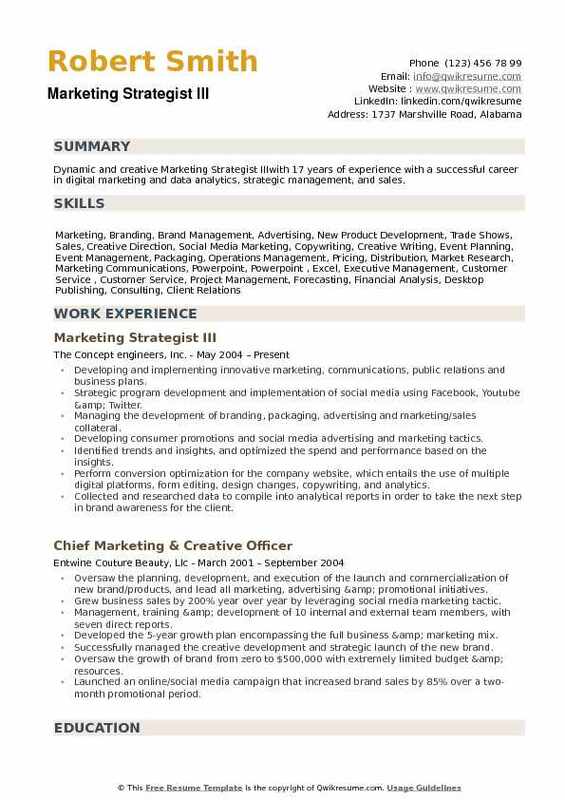 Those seeking to work as a marketing strategist should have a marketing manager or strategist experience, experience in marketing campaigns and web technologies such as social media and online tools, CRM software awareness, familiarity in SEO, SEM, Google Analytics and CMS. 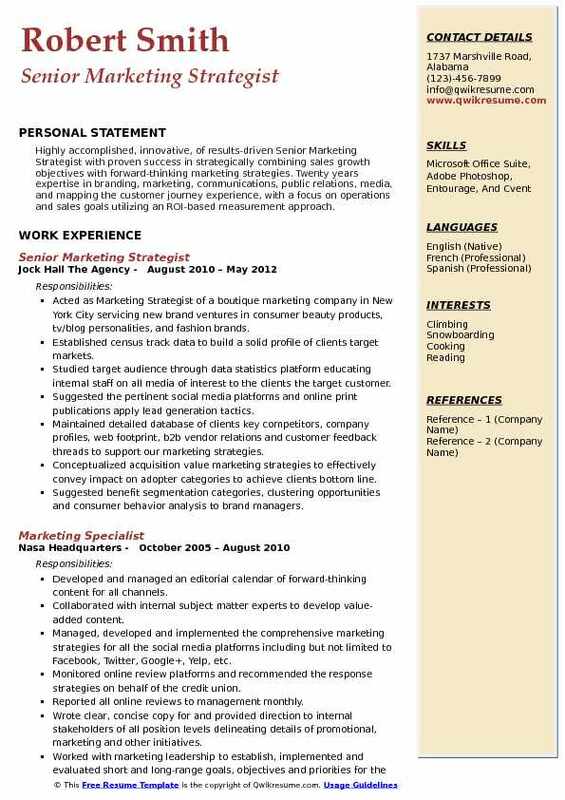 A good resume makes a display of a degree in Marketing or related field. 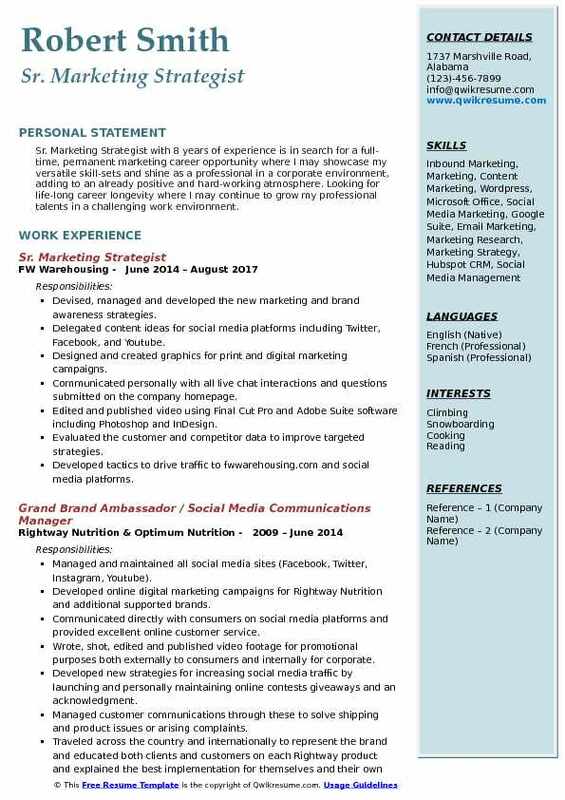 Summary : Highly qualified digital Marketing Strategist with 20+ years of experience in search engine optimization (SEO), search engine marketing (SEM), social media marketing, online reputation management, digital marketing, branding, and web content management. Successful collaborative partner with an advisor to small to large business executives for the creation of innovative solutions to meeting company goals. Working collaboratively with more than 60 long-term clients to timely complete projects based on solid market research to ensure the best marketing path, including digital and traditional. Driving traffic growth from multiple sources, including free and paid search, email marketing, affiliate marketing, social networking, mobile, and on-site placements. Setting the calendar and priority of all sales promotions for social media for the enterprise. Utilizing the split tests (A/B testing) and analytics to drive online advertising while measuring message. Identifying and implementing the strategies to generate continual paid content, including the potential and challenge of constant growth. Maintaining the strategic relationships with Facebook, Google, Snapchat, and Twitter to provide a platform. Negotiating and optimizing the paid advertising offers, including click-per-action based, resulting in an expanded network of active advertisers from zero to 80 active advertisers. Summary : Results-driven Senior Marketing Strategist with 7 plus years of experience in creating marketing strategies and integrated promotional communication plans that includes traditional marketing (direct mail, space advertising radio, events and exhibits, partnerships, and telemarketing) and new media (online advertising, e-mails, e-newsletters, online content, white papers, and social media). Skilled in both B2B and B2C marketing across multiple industries. Responsible for developing and implementing integrated marketing strategies and promotional campaigns to achieve business objectives and revenue goals for four of lifeways business units. Developed and implemented the annual marketing strategy, integrated communication and promotion plans and budgets for each of four business units with combined annual revenues of over $25 million. Strategized and consulted for a new business unit that grew over 75% in revenue in four years by providing data-supported ideas to the sales team and created their new marketing and sales materials. Planned and managed the creation and production of all campaign promotional pieces including direct mail, space advertising, e-mails, online ads, online content, video clips, e-newsletters, media kits, sales brochures and sales collateral materials produced by internal and external creative personnel. Reviewed all promotion pieces ensuring they accurately reflected the brand. Managed event marketing driving attendance for the annual workshop designed to showcase industry expertise, produced new prospects and generated new clients - doubled attendance year over year. Collaborated with business unit leaders on annual new initiatives to reach new markets to expand market reach and brand awareness. Initiated and collaborated with internal marketing research group to gain customer/readership profiles and data crucial to support marketing and sales efforts. Exhibited at conferences and trade shows to increase customers and prospects awareness of full line of products and services to increase sales. 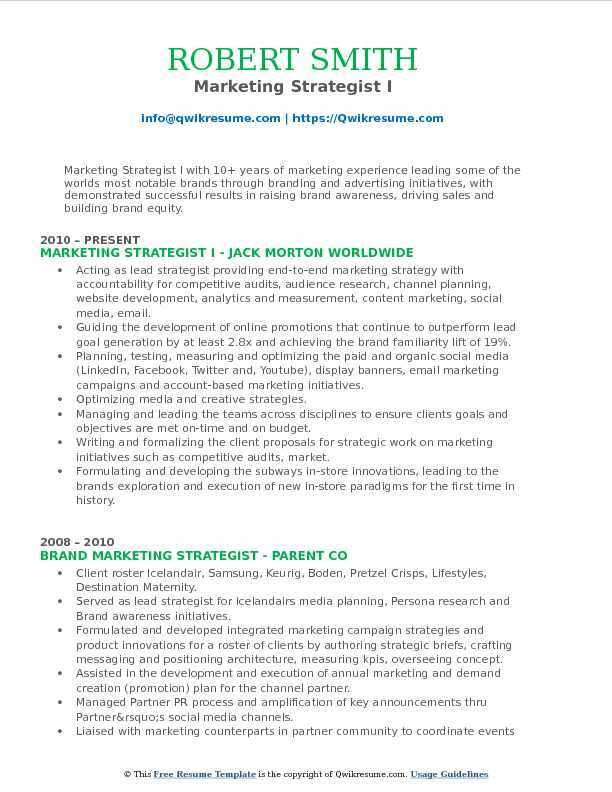 Summary : Sr. Marketing Strategist with eight years experience developing and implementing marketing plans within startup and ad agency environments. Proven ability to drive sales and increase brand awareness for small business clients. 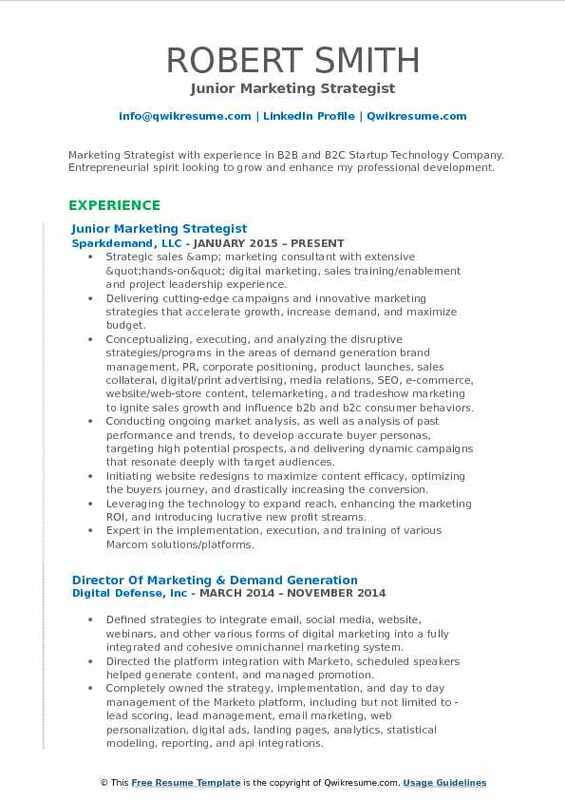 Expertise in multiple marketing disciplines including social, content, email, SEM and event marketing. 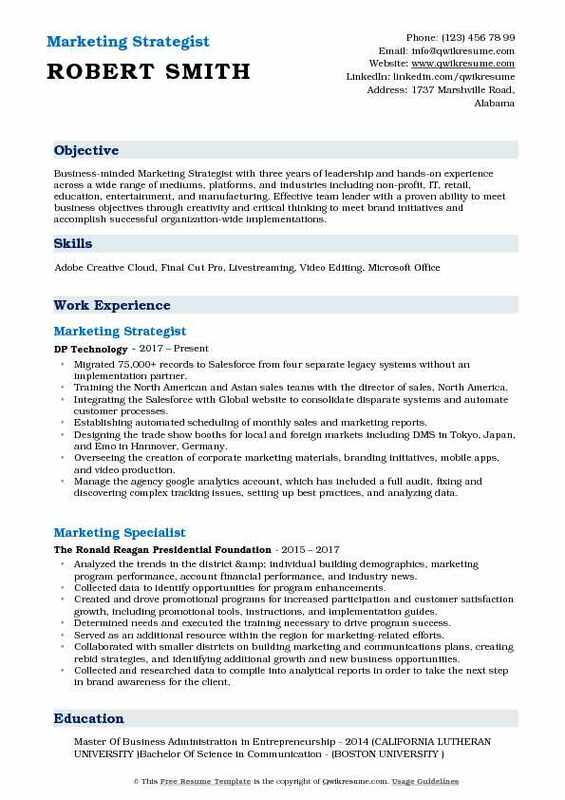 Technical proficiencies include MS Office, Google AdWords, Google Analytics, Sprout Social, WordPress, ClickRSVP, Constant Contact. Planned and executed company's largest bi-annual business development initiative at 2014 national. Developing content and managing dozens of full advertising and promotional campaigns including personally chosen by the President to restructure and manage over $125,000 in digital media. Employed new targeting tactics and decreased average cost-per-click over 76% per online advertising. Optimized existing landing pages by writing and testing copy and layout: increased conversions over 200%. Increased traffic to client blog with a 71% boost in the number of sessions 70% more page views. Compared to management under previous digital agency with more engaging and audience-appropriate. Grew all client facebook page "likes" an average of 28% year-on-year in 2014 with a blend of content. Creation and curation, effective engagement, and targeted advertising. Developed editorial calendar and authored several articles as part of blog content strategy piece. 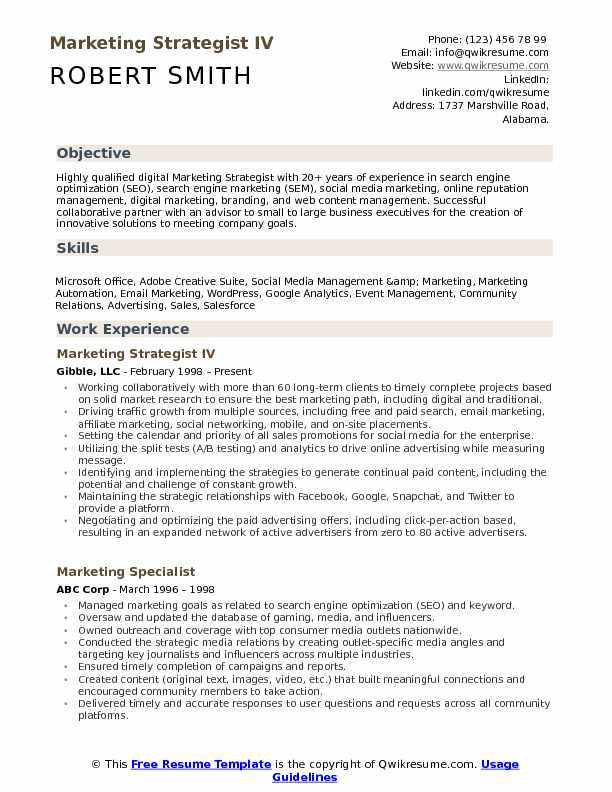 Objective : Marketing Strategist with experience in B2B and B2C Startup Technology Company. Entrepreneurial spirit looking to grow and enhance my professional development. Strategic sales & marketing consultant with extensive "hands-on" digital marketing, sales training/enablement and project leadership experience. Delivering cutting-edge campaigns and innovative marketing strategies that accelerate growth, increase demand, and maximize budget. Conceptualizing, executing, and analyzing the disruptive strategies/programs in the areas of demand generation brand management, PR, corporate positioning, product launches, sales collateral, digital/print advertising, media relations, SEO, e-commerce, website/web-store content, telemarketing, and tradeshow marketing to ignite sales growth and influence b2b and b2c consumer behaviors. Conducting ongoing market analysis, as well as analysis of past performance and trends, to develop accurate buyer personas, targeting high potential prospects, and delivering dynamic campaigns that resonate deeply with target audiences. Initiating website redesigns to maximize content efficacy, optimizing the buyers' journey, and drastically increasing the conversion. Leveraging the technology to expand reach, enhancing the marketing ROI, and introducing lucrative new profit streams. Expert in the implementation, execution, and training of various Marcom solutions/platforms. 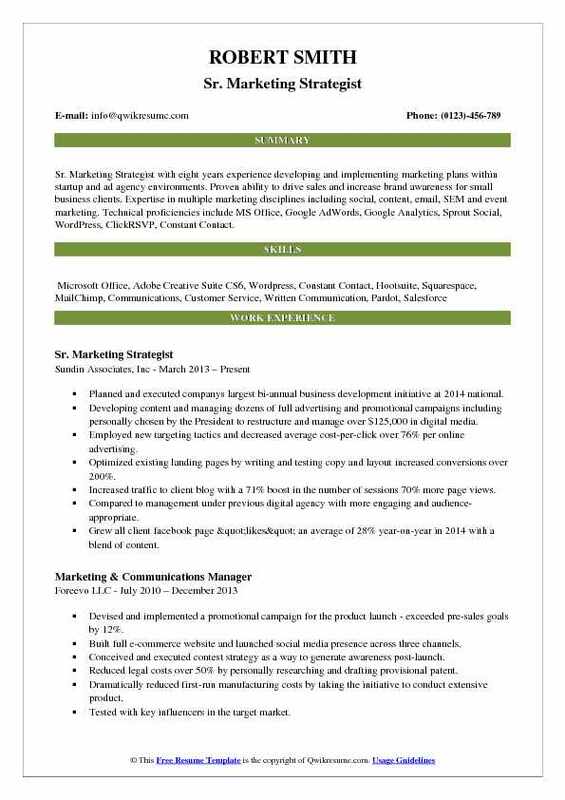 Summary : Sr. Marketing Strategist with 8 years of experience is in search for a full-time, permanent marketing career opportunity where I may showcase my versatile skill-sets and shine as a professional in a corporate environment, adding to an already positive and hard-working atmosphere. Looking for life-long career longevity where I may continue to grow my professional talents in a challenging work environment. Devised, managed and developed the new marketing and brand awareness strategies. Delegated content ideas for social media platforms including Twitter, Facebook, and Youtube. Designed and created graphics for print and digital marketing campaigns. Communicated personally with all live chat interactions and questions submitted on the company homepage. Edited and published video using Final Cut Pro and Adobe Suite software including Photoshop and InDesign. Evaluated the customer and competitor data to improve targeted strategies. Developed tactics to drive traffic to fwwarehousing.com and social media platforms. Brainstormed original content ideas for FW warehousing website and create content marketing materials for both print and digital. 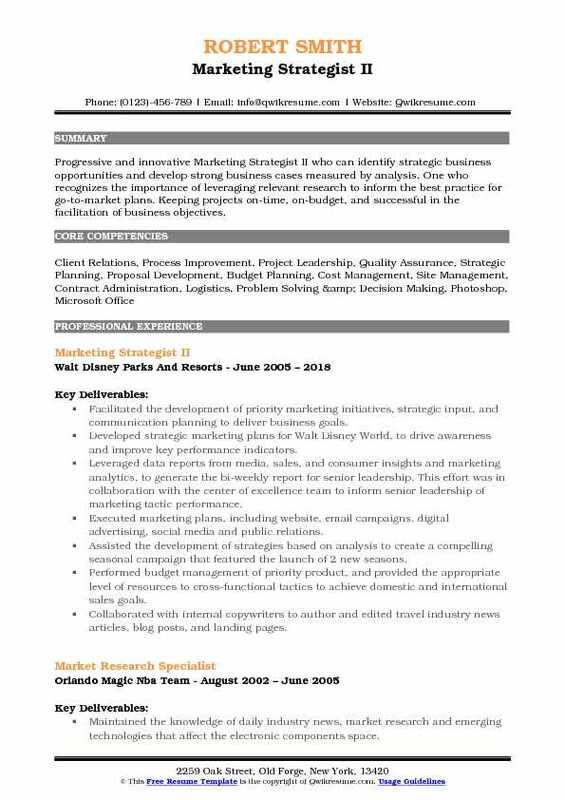 Objective : Business-minded Marketing Strategist with three years of leadership and hands-on experience across a wide range of mediums, platforms, and industries including non-profit, IT, retail, education, entertainment, and manufacturing. Effective team leader with a proven ability to meet business objectives through creativity and critical thinking to meet brand initiatives and accomplish successful organization-wide implementations. Migrated 75,000+ records to Salesforce from four separate legacy systems without an implementation partner. Training the North American and Asian sales teams with the director of sales, North America. Integrating the Salesforce with Global website to consolidate disparate systems and automate customer processes. Establishing automated scheduling of monthly sales and marketing reports. Designing the trade show booths for local and foreign markets including DMS in Tokyo, Japan, and Emo in Hannover, Germany. Overseeing the creation of corporate marketing materials, branding initiatives, mobile apps, and video production. Manage the agency google analytics account, which has included a full audit, fixing and discovering complex tracking issues, setting up best practices, and analyzing data. Tracked daily content and marketing promotions to determine success and/or failure, in order to better understand consumer behavior. Summary : Marketing Strategist I with 10+ years of marketing experience leading some of the worlds most notable brands through branding and advertising initiatives, with demonstrated successful results in raising brand awareness, driving sales and building brand equity. Acting as lead strategist providing end-to-end marketing strategy with accountability for competitive audits, audience research, channel planning, website development, analytics and measurement, content marketing, social media, email. Guiding the development of online promotions that continue to outperform lead goal generation by at least 2.8x and achieving the brand familiarity lift of 19%. Planning, testing, measuring and optimizing the paid and organic social media (LinkedIn, Facebook, Twitter and, Youtube), display banners, email marketing campaigns and account-based marketing initiatives. Optimizing media and creative strategies. Managing and leading the teams across disciplines to ensure clients goals and objectives are met on-time and on budget. Writing and formalizing the client proposals for strategic work on marketing initiatives such as competitive audits, market. Formulating and developing the subways in-store innovations, leading to the brand's exploration and execution of new in-store paradigms for the first time in history. Summary : Progressive and innovative Marketing Strategist II who can identify strategic business opportunities and develop strong business cases measured by analysis. One who recognizes the importance of leveraging relevant research to inform the best practice for go-to-market plans. Keeping projects on-time, on-budget, and successful in the facilitation of business objectives. Facilitated the development of priority marketing initiatives, strategic input, and communication planning to deliver business goals. Developed strategic marketing plans for Walt Disney World, to drive awareness and improve key performance indicators. Leveraged data reports from media, sales, and consumer insights and marketing analytics, to generate the bi-weekly report for senior leadership. This effort was in collaboration with the center of excellence team to inform senior leadership of marketing tactic performance. Executed marketing plans, including website, email campaigns, digital advertising, social media and public relations. Assisted the development of strategies based on analysis to create a compelling seasonal campaign that featured the launch of 2 new seasons. Performed budget management of priority product, and provided the appropriate level of resources to cross-functional tactics to achieve domestic and international sales goals. Collaborated with internal copywriters to author and edited travel industry news articles, blog posts, and landing pages. Produced and presented creative and project briefs, based on key marketing strategies, to an in-house advertising agency for Disney springs social media and out of the home. Summary : Highly accomplished, innovative, of results-driven Senior Marketing Strategist with proven success in strategically combining sales growth objectives with forward-thinking marketing strategies. Twenty years expertise in branding, marketing, communications, public relations, media, and mapping the customer journey experience, with a focus on operations and sales goals utilizing an ROI-based measurement approach. Acted as Marketing Strategist of a boutique marketing company in New York City servicing new brand ventures in consumer beauty products, tv/blog personalities, and fashion brands. Established census track data to build a solid profile of clients target markets. Studied target audience through data statistics platform educating internal staff on all media of interest to the clients the target customer. Suggested the pertinent social media platforms and online print publications apply lead generation tactics. Maintained detailed database of clients key competitors, company profiles, web footprint, b2b vendor relations and customer feedback threads to support our marketing strategies. Conceptualized acquisition value marketing strategies to effectively convey impact on adopter categories to achieve clients bottom line. Suggested benefit segmentation categories, clustering opportunities and consumer behavior analysis to brand managers. Managed a small staff of publicist, graphic artists, photographers, creative service vendors and website developers. 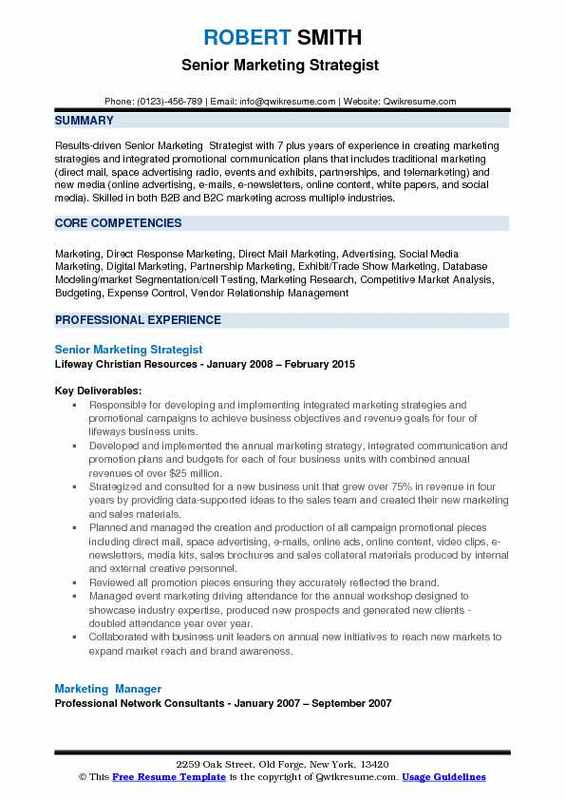 Summary : Dynamic and creative Marketing Strategist III with 17 years of experience with a successful career in digital marketing and data analytics, strategic management, and sales. Developing and implementing innovative marketing, communications, public relations and business plans. Strategic program development and implementation of social media using Facebook, Youtube & Twitter. Managing the development of branding, packaging, advertising and marketing/sales collateral. Developing consumer promotions and social media advertising and marketing tactics. Identified trends and insights, and optimized the spend and performance based on the insights. Perform conversion optimization for the company website, which entails the use of multiple digital platforms, form editing, design changes, copywriting, and analytics. Collected and researched data to compile into analytical reports in order to take the next step in brand awareness for the client. Develop and manage online marketing campaigns for diverse industry clients, driving brand awareness, engagement, and traffic.